My goodness, it has been crazy around here in so many ways!! Today is the second official full day of spring and we have 3 inches of snow. We are prepping to leave for Cali tomorrow, so you know how that is. A lot of running around tying up loose ends and packing. Next week I have several guests lined up to fill in for me, and I am so excited to have them here!! I know you will enjoy them as much as I have. 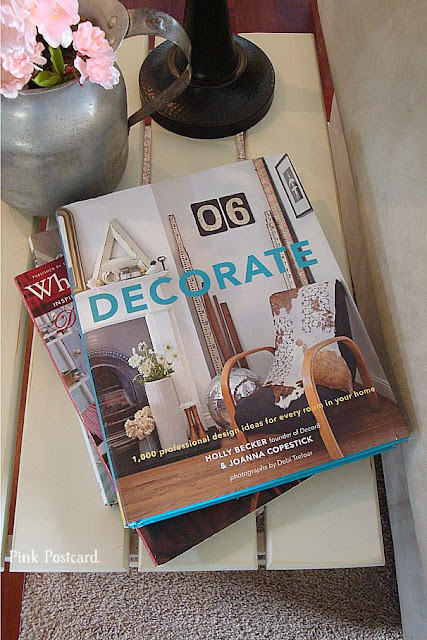 I have an opportunity to guest post and do a house tour on another favorite blog soon, so it's kinda like having out of town house guests coming, and you try and get projects wrapped up that have been hanging around unfinished! 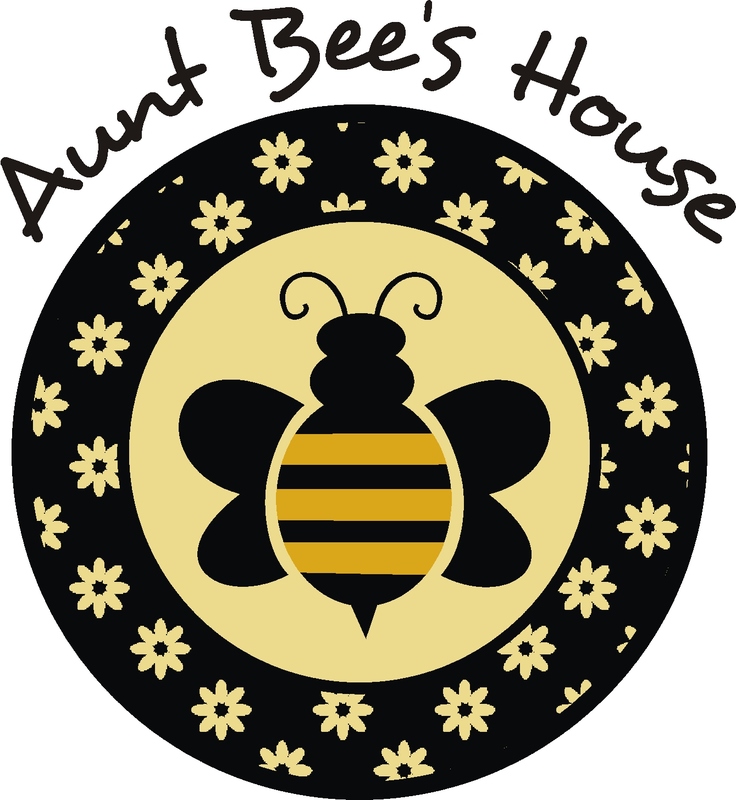 I thought I'd show you a couple things I've done recently around the house. You may have seen this pinned on Pinterest- it's one of my favorites too. I always love finding interesting silver trays on my hunts, and I've kept a few of my favorites. Anything with monograms- and I don't care if it's our letter or not- is great with me! 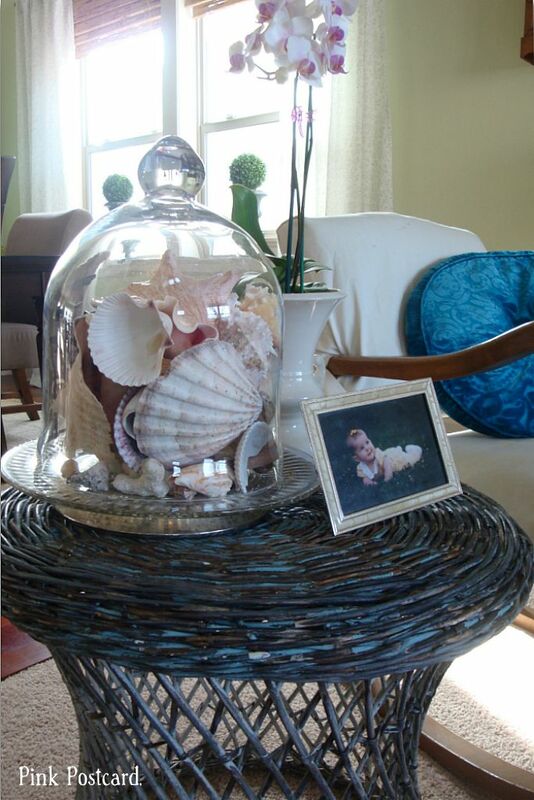 From the same photo, I also incorporated the cloche of shells. I come across shells a lot, and love to decorate with them. There are also some coral pieces from Hawaii that we found on the beach in Oahu that I mixed in. If you don't have it, or haven't looked at it, I recommend you add it to your library!! So much good stuff! 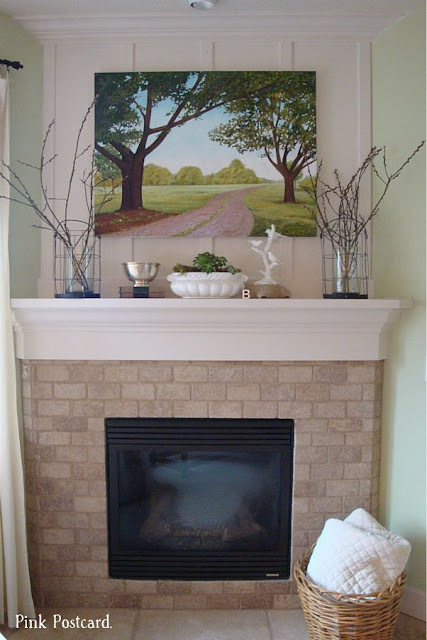 I've always loved the mantel on the cover, and incorporated the look to my own. The vintage books and trophy were from a recent shopping trip- I had planned to sell them, but was smitten and decided to keep them for now. Trophies cups are highly sought after and super expensive. 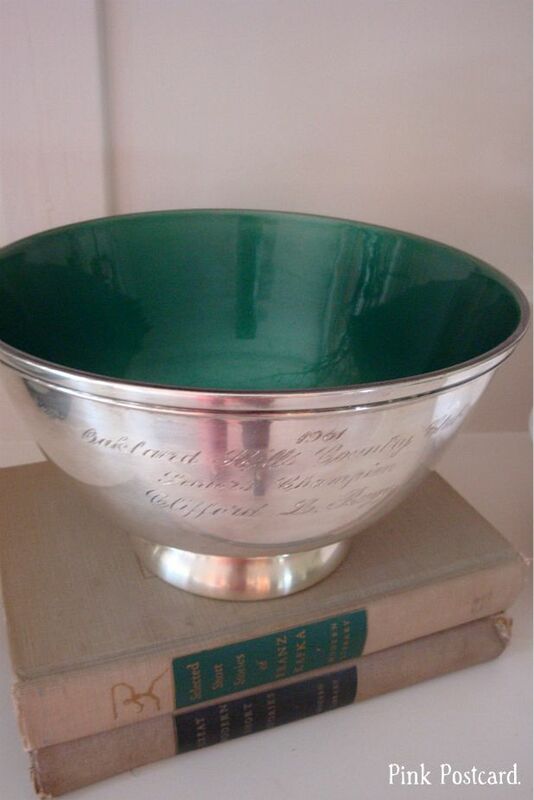 I have found a less expensive option in these Revere style silver bowls. 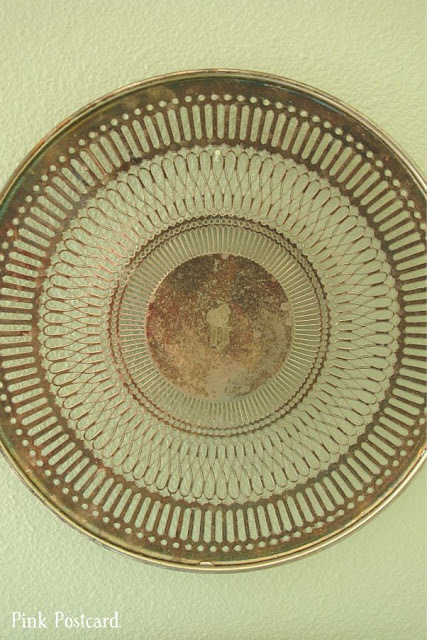 Often you can find them with engraving. 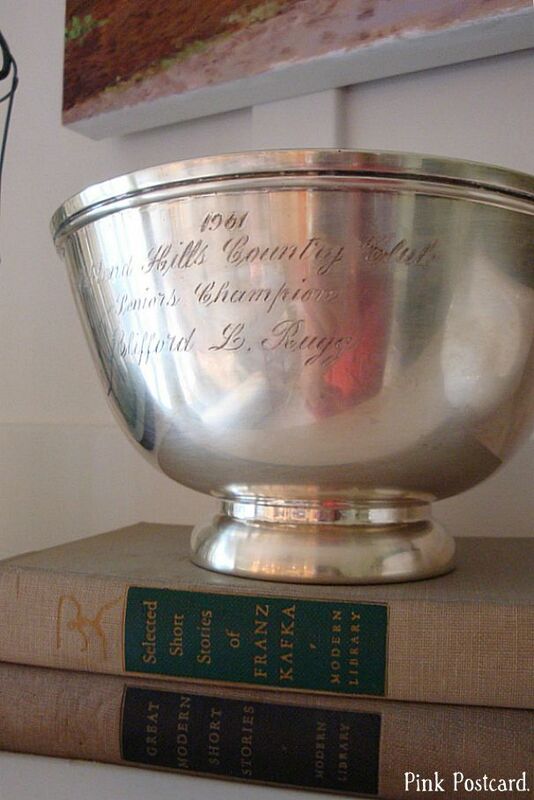 I loved this one because it has a green enameled interior, is from the 60's and is a Country Club trophy. Finally, our dining table has a large urn on it now. I've had this for awhile, but always on the floor. I love having it on the table. 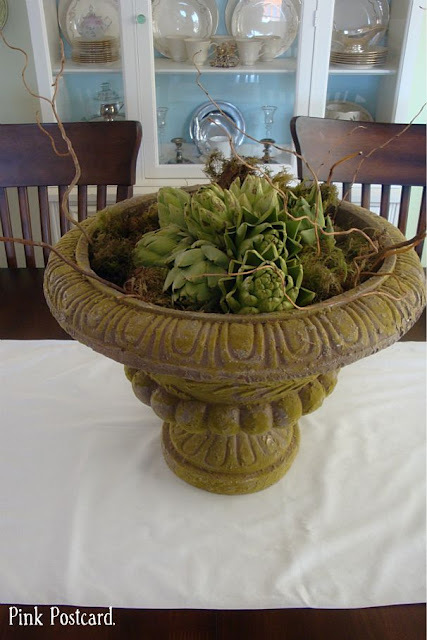 It is filled with moss, a few stray curly willow and some artichokes. Simple and green. The runner is the same one I've been using since before Christmas. But with a B, for our family name. 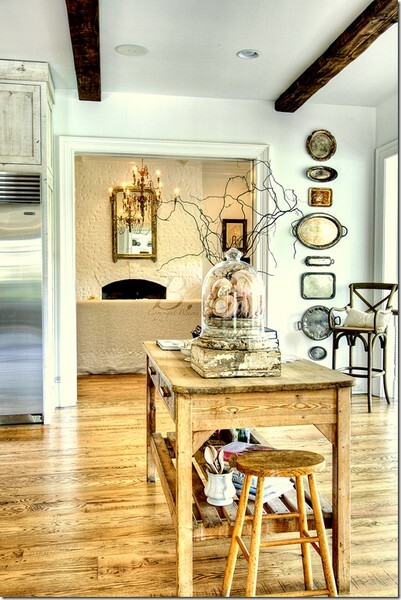 I hope you are incorporating some of your inspirations around your home! LOVE all of this!! How did you hang the silver trays? 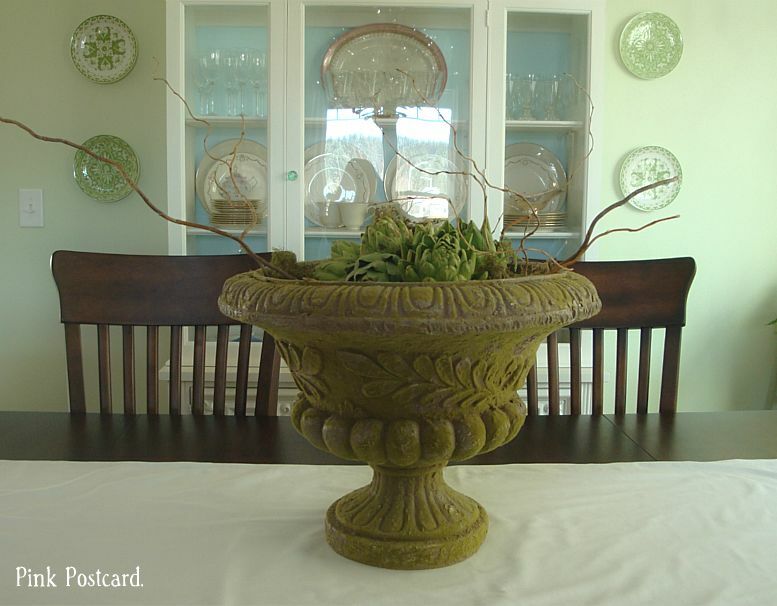 I LOVE IT ALL especially the urn with the moss and artichokes! Love those collections. Oh, my! Hopping by and followed your FB and Pinterest. 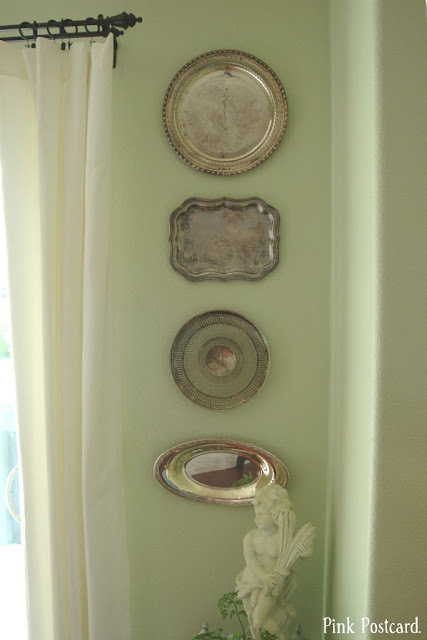 I love the inspiration photo and I think your trays look fabulous! As asked above, how to you hand them? I'll reply here for the benefit of eveyone- Disc Hangers work great for hanging the trays! I had some on hand but you can also use some adhesive hangers from a hardware store. I recommend using a dab of hot glue to the adhesive though- these ones aren't as strong as Disc Hangers! I just discovered your blog while looking for link parties. I am so happy to have found it. 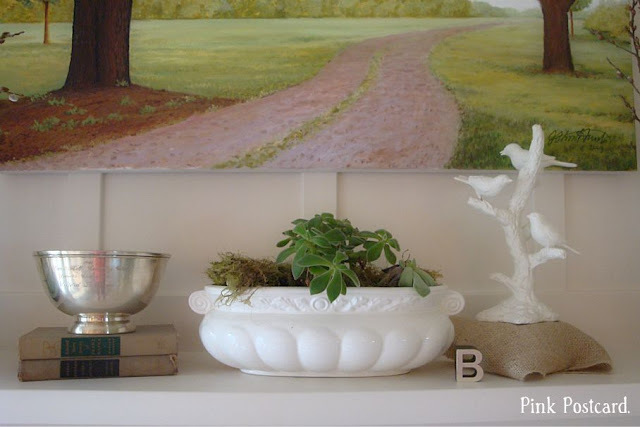 I absolutely love the mossy urn with the succulents. It nice to see the outdoors brought in.